We are renting vases of 3 different sizes, along with a bunch of votives. We are paying $30 for all of them! 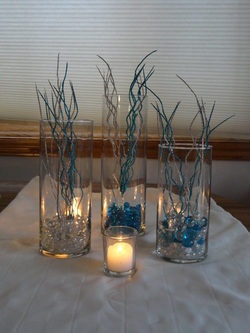 Here is a mock up of the centerpieces my mom did. The picks are $.99 each and we are using about 200 total (100 silver, 100 blue). We will be mixing the blue and white marbles (like the vase on the right). I will probably position the vases a little differently, but in general this is the idea! The next photo is with some petals, and I love the look of this! The petals I think are $4.99/box. We will probably use 3-4 boxes. We are also using 40% off coupons to save money at Michael's! Update: We are not using the votives like that. 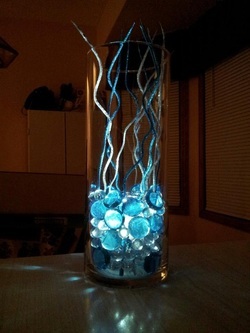 We are putting them inside the vase to hold an LED light. My mom came up with this idea so we can put the centerpieces together beforehand. Then we can turn the LED lights on and drop them into the votive when it's time to set them up! Also, the picks will be cut down a bit so they don't stick up so much. A better idea of what it ended up looking like. Hopefully we will get our pro pics soon to see them in action!